Now we use more gadgets on-the-go than ever, we need the power to help them go the distance. We've got a huge selection of Duracell batteries to keep your cameras, camcorders, MP3 players and more powered up for longer. Tried and trusted Duracell batteries are renowned for their quality and staying power. Whether you're looking for everyday batteries for TV remotes, clocks and radios, or something a bit more specialist for digital cameras, portable speakers and watches, you'll find the batteries to match in our Duracell range. 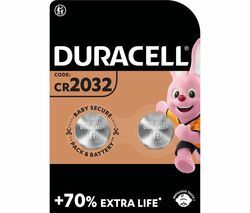 Save with Duracell battery multipacks. Common batteries like AA, AAA, C, D and 9V are available in money-saving multipacks so you can stock up for less. 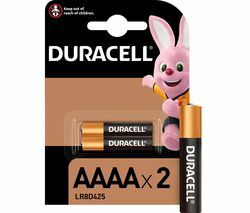 Save with Duracell rechargeables. Duracell's rechargeable AA and AAA batteries can be recharged hundred of times, and stay charged for up to six months when not in use. They're powerful and perfect for power-hungry and frequently used devices. These Lithium-ion rechargeable batteries last much longer than traditional batteries, and charge up faster too. Unlike lead acid batteries, failure to charge Lithium-ion batteries to 100% won't damage the batteries in the long run, so you get batteries that last longer and offer more value for money. Save even more with battery-and-charger packs. The Duracell CEF15 15 Minute Charger is compatible with AA and AAA batteries and charges four AA batteries in just 15 minutes. With four independent charging channels to suit any combination of AA and AAA batteries, the charger automatically detects the battery type and has a maintenance charge feature that keeps batteries fresh and emits less noise in the process. We've got everything you need to stay powered up on-the move, from batteries and portable chargers, to travel adapters. And our Duracell batteries keep all your gadgets and appliances powered up at home, providing reliable power for safety devices like alarms.